Free-Range Toddlers: A Farm-Based Childcare Program Counters the Overprotective Parenting Trend | Features | Kids VT - small people, big ideas! 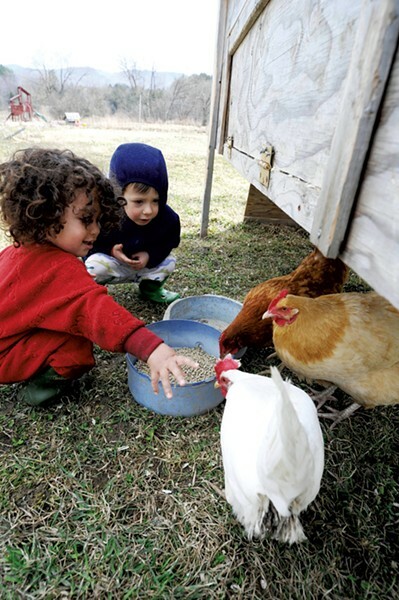 Ezrah Fishman and Silvan Thompson feeding the chickens at Elephant in the Field Holistic Education & Childcare in Waterbury. "Looking for art supplies" plays out a little differently at Elephant in the Field Holistic Education & Childcare. Instead of rummaging through a plastic bin on an early spring day that was cold enough to keep some inside, five toddlers don snow pants and boots. Their project is to create a bogolan, or West African mud cloth, which is traditionally used in religious and cultural ceremonies. To make it, they'll need some fresh mud. Before the kids leave the house, their teacher, Marlena Tucker-Fishman, who's African American, shows them an authentic, earth-colored mud cloth of her own. "What if we can't find any mud?" asks a towheaded 2-year-old girl. "Oh, you'll find some," says Tucker-Fishman, as she straps a 7-month-old boy on her back. "There's plenty, but I'm not going to tell you where." 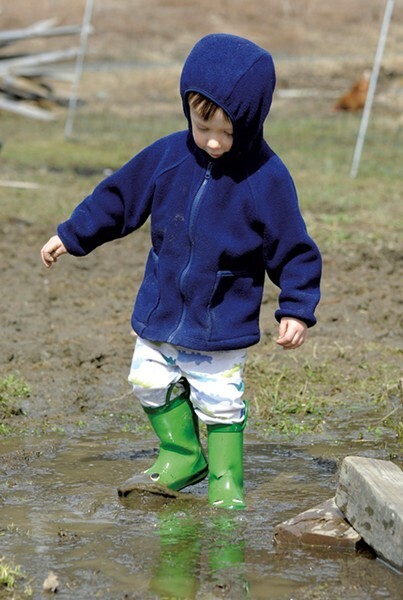 Once outside, it takes the preschoolers no time to discover why Vermonters call this time of year mud season: The stuff is everywhere in Elephant in the Field's soggy, unpaved driveway. 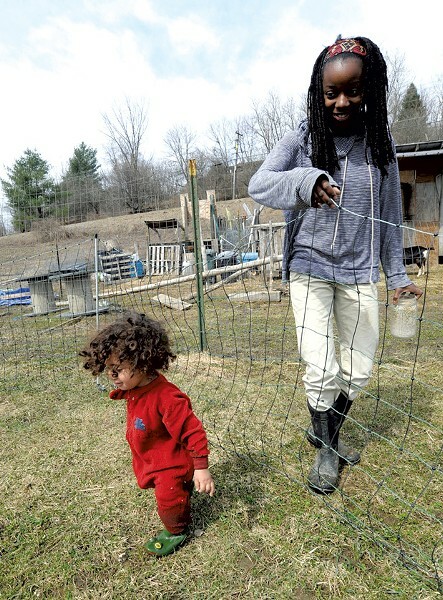 The home-based daycare program is located on a 42-acre family farm in Waterbury Center, not far from the Ben & Jerry's ice cream plant. Surrounded by mountains, the farm is bordered by woods and a meandering brook, which the kids explore in warmer weather. As Tucker-Fishman spreads out an old beige sheet in the driveway, some of the children, including her 21-month-old son, Ezrah, scoop up the gooey brown muck in plastic containers and start painting on the sheet, themselves and each other. "Just to show how they can use materials all around them to create art, and that there's beauty in everything," Tucker-Fishman explains. "There's always a deeper lesson." Indeed, this farm-based childcare program is full of them. Its name refers to a large topiary elephant that stands amid the crops and is visible from the road. But it could also refer to the elephant in the room of modern-day childrearing: In recent decades, kids have become less inclined to spend time outdoors learning vital physical, intellectual and emotional lessons from nature. That's in part because American parents have become increasingly risk-averse, less likely to encourage their kids to test limits and play in the mud. It's a trend Hanna Rosin explored in an April 2014 Atlantic cover story, "The Overprotected Kid." In her widely read and much debated piece, Rosin described how our saftey- and fear-obsessed culture has deprived children of their ability to self-regulate, overcome fears and develop courage, strength, resilience and creativity. Rosin sees hope in the European development of "adventure playgrounds" such as the Land, in Wales, where kids are free to hammer nails, light fires, climb trees and manage risk in largely unstructured environments (see sidebar). Elephant in the Field does that closer to home, albeit it with more structure and a focus on younger kids. But the values and skills it seeks to instill are similar. Tucker-Fishman describes her approach to early childhood education as "nature-based" and "holistic," incorporating music, art, foreign language, yoga and ample doses of wilderness play. The 30-year-old New Jersey native moved to Vermont with her husband six years ago from Washington, D.C. She has a background in special education, helping kids with learning delays become more independent and self-sufficient. When she established Elephant in the Field two years ago, Tucker-Fishman wanted her childcare program to teach those same life lessons. In essence, the family farm and its environs became her extended classroom. For example, each day, she incorporates farm chores, such as feeding and watering the animals, spreading fresh hay, exercising the goats and gathering eggs, into the children's routine. "It's all part of our flow of the day," she adds. "All the learning is done around their interests. We take the approach that everything is connected." On the spring day of my visit, when the kids' interest in mud-painting wanes, Tucker-Fishman announces it's time to feed the goats and chickens. As most of the kids enter the animal pen and navigate its inherent hazards — ragged chicken wire, splinter-inducing wood planks and the occasional pile of goat poop — two distracted toddlers venture further down the driveway toward the paved road, stomping in every mud puddle along the way. Tucker-Fishman doesn't immediately halt their messy meandering, even when the tots are nearly out of earshot. "You'll notice I'm not calling them back," she says. "I like to see what they'll discover." In some respects, the preschoolers are as free ranging as the chickens scratching in the dirt for bugs. Several parents whose kids attend Elephant in the Field say they chose the program precisely because of that adventuresome approach. "I like that my child comes home dirty!" says Kerry Boyle Jenni of Waterbury, whose 2-year-old son, Daniel, started attending EITF a few months ago. Jenni, who describes her Swiss husband and herself as "inherent risk takers," puts it this way: "I don't want a childcare provider who puts the kids in front of a TV all day or stays inside on beautiful days. Knowing Daniel is interacting with goats and chickens and playing in dirt and mud makes me happy." Janelle Gendimenico of Waterbury Center agrees. She has three children attending Elephant in the Field: two daughters, 5 and 3, and a son who's 9 months old. Gendimenico says her kids love it there, in part because they spend so much time outdoors, exploring the woods and playing on the farm. "They come home full of information about what they learned that day," she says, "and sometimes don't even know they're learning, as they are having so much fun." Gendimenico, who teaches English-language learners at Edmunds Middle School in Burlington, says that in her 13 years as an educator, she's seen firsthand the impact of "helicopter parents" who never allow their kids outside or encourage them to explore their world without supervision. "It's creating a sense of fear that doesn't need to be there," Gendimenico adds. "I think those students are less likely to reach out to others, insert themselves into groups or put themselves into situations that are uncomfortable, because all they know is what's safe and what's less risky." 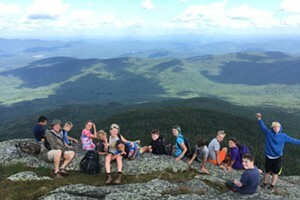 Such discussions about nature-based learning and exploration are "very near and dear to our hearts," says Jeanne Goldhaber, associate professor of early childhood education in the University of Vermont's College of Education and Social Services. 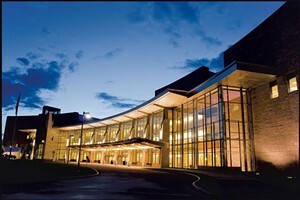 Goldhaber's program is closely affiliated with the UVM Campus Children's Center, which educates and cares for kids 6 weeks to 5 years old. Several years ago, the program experimented with putting rocks and tree stumps in the center's infant room in an effort to "bring the outdoors in. "One of the first things we observed is that the children didn't get hurt," Goldhaber says. Despite the young ones' still-developing motor skills, coordination, balance and dexterity, the babies quickly learned to interact with their environment using deliberate care and caution. 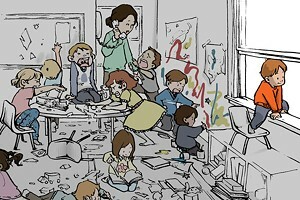 "That, for us, was a real lesson about children's competence," she adds. "If we pad all the corners and all the floors, then how do children learn an awareness of the environment and how to navigate it?" Meanwhile, at Elephant in the Field, when the two wandering toddlers get too far away for comfort, Tucker-Fishman reels them in. After all, raising free-range kids — a term coined by New York writer Lenore Skenazy, whose book and blog are titled Free-Range Kids — isn't about letting children run wild without any boundaries whatsoever. It's about teaching them to stretch their own boundaries safely but confidently. "We're not going to the bus stop now. Come this way!" she yells to the boys. The two come toddling back and soon join the rest of the children, who are poking through the hay looking for fresh eggs in the chicken coop. While this is largely unstructured time, Tucker-Fishman says that countless lessons, most of which arise spontaneously, are learned on the farm every day. "When we first started, some of the kids would chase the chickens," she recalls. "Now, they look at them as part of the whole community. We give to them and they give to us." As if on cue, one of the youngest girls discovers a single brown egg buried in the hay. When an older peer complains that the girl is too young to carry it back to the house without breaking it, Tucker-Fishman allows it anyway. As she explains to the older child, "How else will she learn to be safe with it?" How do parents know when Vermont childcare providers break the rules?